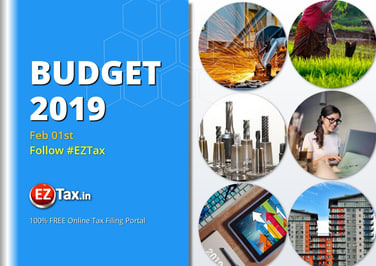 A full tax rebate for individual taxpayers with annual taxable income up to Rs 5 Lakhs u/s 87A of the Income Tax Act due to which such taxpayers will save income tax of Rs.12,500 per year. 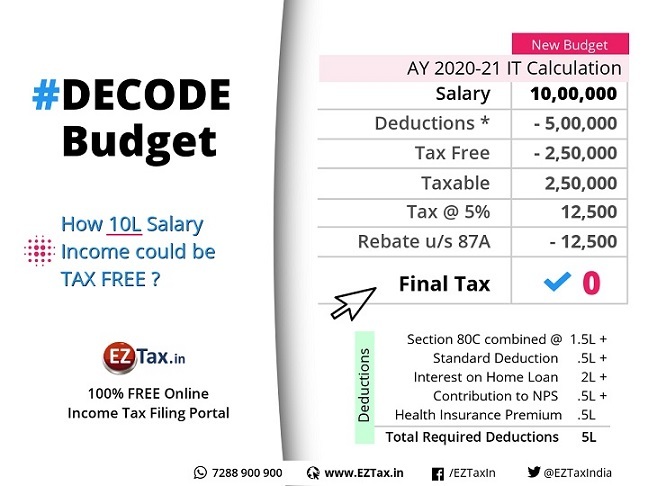 This is in addition to raised standard deduction from Rs.40K to 50K. Please watch our Tweets to see how different scenarios work and in addition, use the NEW IT Calculator for AY 2020-21 to know more as well. Irrespective of your income, tax filing was made mandatory to have full compliance. Notable Announcement: Under section 54 of Income Tax Act, where previously, the capital gains (upto Rs.2 cr) could be invested in only one property, now the investment can be made in two residential properties. Impact: This would help taxpayers who want to shift from one house to two houses due to family split (or any other reason) to avail tax exemption, and is available once in a lifetime. Direct Income Support of Rs. 6K per year to farmers with a land holding of 5 acres (2 hectors), would benefit 12 Crore People. In addition, it was announced that MSP will be increased to 1.5 times of cost of production for 22 crops (many new). Impact: These along with substantial funds allocated for rural development and to create new jobs is a +ve direction and will re-vitalize the rural economy, though the support given was not substantial but is in the right direction. Quite several announcements made in budget that will affect SMEs. Businesses with annual turnover up to 5 Crs can opt for Quarterly filing for GST Returns. Increase in limits for eligibility of composition schemes for manufacturers and traders is now set to 1.5Cr from 1Cr. GST composition scheme also made available for small 'service' providers whose turnover is up to 50L. In addition, government introduced, a facility to approve the MSME loans up to 1Cr with in 59 minutes. Overall, some of these were already announced by the GST Council in the past but re-iterated in the Budget. Special focus on housing is a great move for the real estate sector, both on the builder / developer side and the house owner / investor side, which was otherwise not so great in last two years due to RERA & GST impact. Stocks in Housing sector will see good traction in selling their unsold inventory and initiating new projects while this is highly depending on the Location. Single window clearance for film making to domestic players and increased anti-piracy measures for films will aid the movie makers as well as multiplex operators. Impact: Stocks & existing investments in this area may see good news. New funds allocation from 20K Cr to 305K Cr to Defense to secure Indian borders, is a great news for the associated industries & Defense PSUs. Government announced to launch ‘Pradhan Mantri Shram-Yogi Maandhan’ to provide pension of Rs.3K /month (60 years and above) for the unorganised sector workers with monthly income of up to Rs.15K. This will give a boost to ~89% of the workers in the informal sector (eg. construction workers, house maids etc. ), further increase the consumption. Hon'ble Finance Minister Mr. Piyush Goyal made a delicate balance between people's expectations and fiscal prudence. While opportunities are explained above, the challenges are in the fine print on how well the ministry reaches its planned tax collection.